There’s only one main difference between dish soap and dishwashing detergent, but it’s a big one. Dishwashing detergent does not create suds, but dish soap does. The idea of a dishwasher overflowing with bubbles might paint a funny picture. Unfortunately, however, it’s not “funny” in reality so much as it is a big, messy problem. If this only happens once, it’s a headache. If it happens more than once, it can lead to soap scum build up. Eventually, it could even break your dishwasher entirely! If the worst happens and you find yourself facing an endless soap avalanche, don’t fret. We’ll walk you through the process of cleaning the mess at home. Remember – if you’re ever uncomfortable with an at-home plumbing project, there’s nothing wrong with calling the pros to help. First things first, stop the dishwasher right away. Cancel the wash cycle. If you’re lucky, maybe the suds haven’t quite overflowed just yet. The sooner you turn off the dishwasher, the better your chance of keeping the suds out of the machine’s inner workings. As soon as you’ve canceled the cycle, the dishwasher should start draining. It won’t clear everything out, but it’ll make the clean-up process a little less damp. Get materials to help sop up any overflow. If you weren’t able to stop the cycle in time, you’ll have some cleaning up to do. Do that cleaning up right away! If you let water sit, it’ll start seeping into cabinetry or floorboards. You’ll also want to use a wet mop to clean up the overflow. Since the mixture is water and soap, wiping it up with dry towels can leave residue behind. Before you go in to clear out the pipes and drain, you’re going to have more sopping up to do. Open the dishwasher after it finishes its initial draining. Take all the dishes still inside the dishwasher out and move them into the sink. Rinse off the dishes in the sink to remove any scummy residue that might have clung to them during the overflow. Consider washing the dishes by hand just this once, while you’re dishwasher is… recovering. Otherwise, just rinse them off and leave them in the sink. After you’re done cleaning, you can simply put the dirty dishes back in the washer for another cycle! Finish clearing out the dishwasher. This is the labor-intensive part. You’re going to have to rinse out and dry the entirety of the inside of your dishwasher. You’ll keep having problems with suds and soap scum until it’s completely removed. Get a small bowl and repeatedly fill it with clean water, rinsing away bubbles. Keep rinsing until bubbles don’t appear when you pour the water into the inside and bottom of the appliance. After you’ve rinsed enough, use towels to wipe down and dry out any remaining water. You’ll probably have to remove the drawers to complete this step. Turn on the rinse cycle and let it run. You don’t have to do a full cycle. Run the rinse cycle for three to five minutes. It’ll be enough time to let you know if there are any remaining suds. If you’ve done everything else listed here, there shouldn’t be. If there are suds, the rinse cycle will wash out any remaining residue. 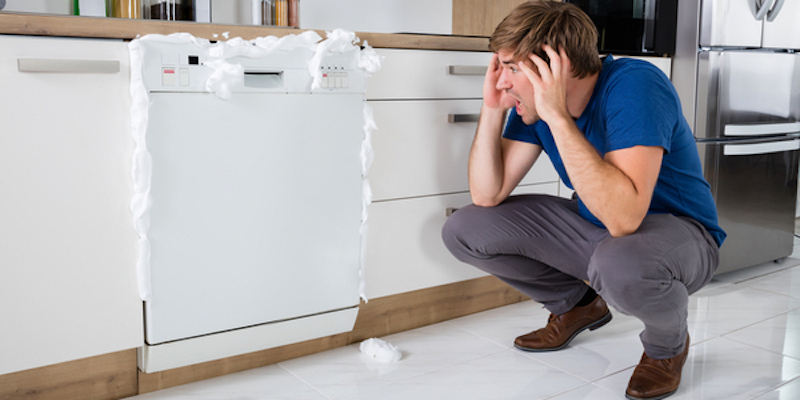 Once that’s done, your dishwasher should be back in working condition. There you go! You successfully flushed your dishwasher after a soap sud fiasco and lived to tell the tale. The next time this or any other plumbing emergency happens, however, give us a call. The team at Mike Diamond has your back no matter the time or day of the week.